Looking for a new job, better pay and your next adventure? 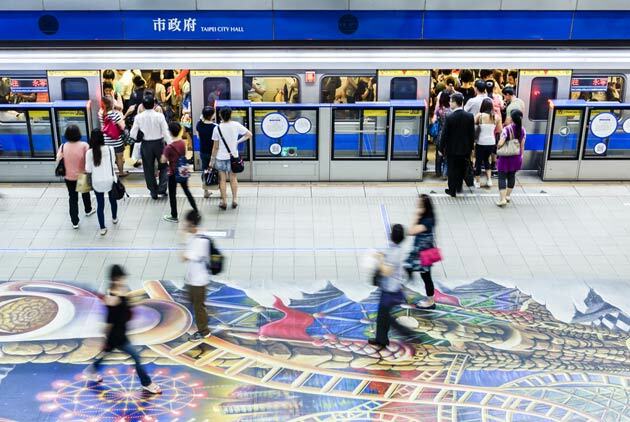 Singapore comes top of a list of the best countries for expats to work, live and increase their earnings, while Switzerland offers the biggest salary boost. 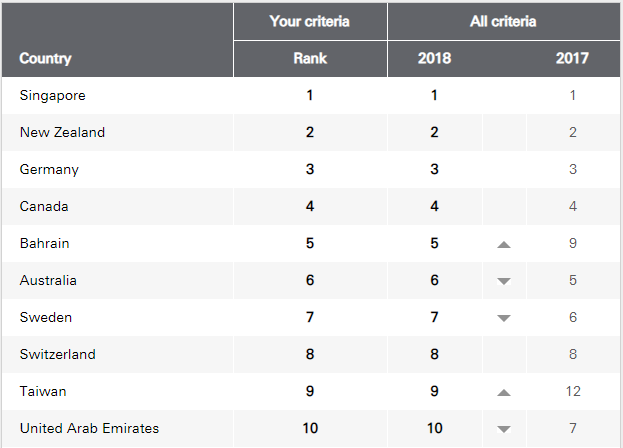 The city-state is top of HSBC’s annual Expat Explorer report, which surveyed 22,318 expats about their jobs, salaries and lives overseas. Getting a job abroad can boost your salary by an average of $21,000, according to the HSBC report – with almost two-thirds of expats globally enjoying a higher income as a result of moving. More than half (58%) of the expats surveyed said their equivalent job paid more in the new location, with half saying they pay less tax. Expat earnings in Switzerland average $203,000 a year, which is almost twice the global average. The US ($185,000), Hong Kong ($179,000), China ($173,000) and Singapore ($162,000) complete the top five countries for highest expat earnings. Switzerland, which ranked eighth overall, has the highest average income in the world and expats see their salary increase by an average of $61,000. But it’s also among the most expensive places to live on the planet, with Zurich and Geneva topping UBS bank’s list of the world’s most costly cities. The Economist’s tongue-in-cheek Big Mac Index, to calculate purchasing-power parity (PPP), found a burger in Switzerland costs $6.61 compared to $5.51 in the US, meaning the Swiss franc was overvalued by 18.8%. Rent on a two-bedroom apartment in Zurich or Geneva comes in at more than $2,000 per month, while groceries will set you back $458 dollars per person, per month. But despite these high living costs, expats feel financially secure and stay for the long haul. In the survey’s Economics index, the country came top for political and economic confidence. Only 1% of respondents say they are concerned about the local economy while just 9% expressed anxiety about their financial future. 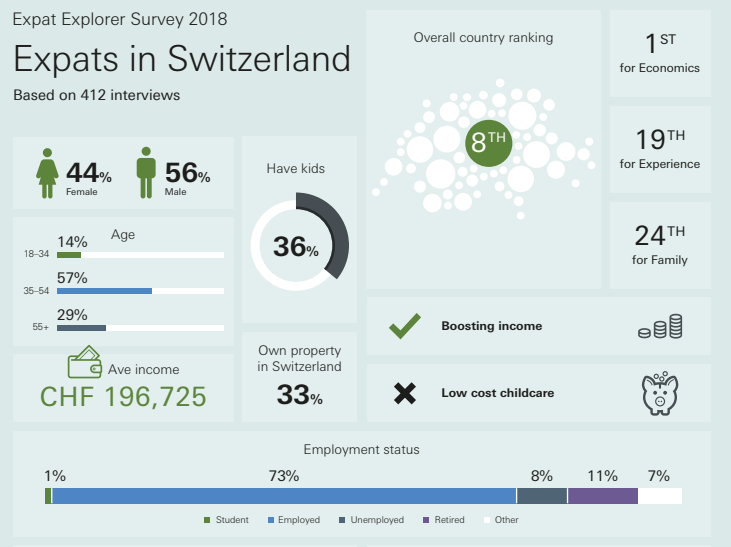 But it’s about more than the money – almost half (45%) say they have stayed in Switzerland because of the quality of life, with 89% having been there five years or more. The financial hub of Singapore was the best place in the world for expats to move to for the fourth year running, and came third for Economics. Its stable economy is a big draw, with almost half (45%) of expats moving to the island nation to further their careers, while more than one-third wanted to boost their earnings (38%). Average earnings are $162,000 – $56,000 more than the global average. Four out of five are confident in the country’s political and economic stability. But, like Switzerland, the cost of living is high. Half of the expats surveyed are unable to buy a home, and renting a one-bedroom apartment costs as much as $3,300 per month. A Big Mac costs $5.80 to the US’ $5.5, while groceries will cost you around $145 per week. 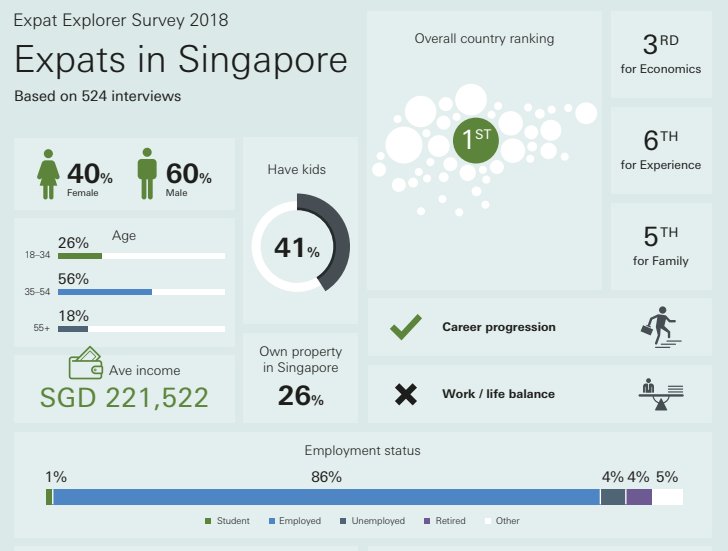 With its tropical surroundings and safety, almost half (47%) of expats have stayed in Singapore for the quality of life it offers their families – and 60% of expat parents say their children's health and wellbeing is better there than at home. Next What's your #Taiwander story?